Learn how to register and get the student materials for your next scuba class! Three simple steps and you can get started right away! Ready to sign up for your next class? No matter which class you choose, all students must follow a few steps before coming in to class. You must register as a student with Underwater Connection, sign up for your class and fill out some paperwork. If you have completed the 3 steps, you are all set and ready to start learning about the underwater world! All students must be registered with Underwater Connection so they have access to their materials! The registration process is simple and free, so you can take this step even if you are unsure of when exactly you can join a class. 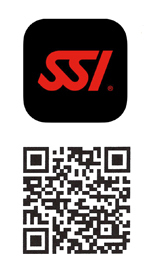 Click the link or scan the QR code above with your smart phone’s camera to get registered. All classes need payment upon scheduling. But you can do that from anywhere, anytime! Just follow the link above and add your class of choice to the shopping cart. If you need more details on any of UWC’s courses, click here. All scuba classes involve home-study digital materials that must be completed before your scheduled day of class. The materials can be completed at your own pace and anywhere! Just login to your MySSI account and get access to the materials online or offline, from a computer, smart phone, or tablet! All classes also require a Medical Release. You can print it from the link above or pass by UWC and we will give you a copy.